Famous Russian medium tank, first version T-34 Model 1940. 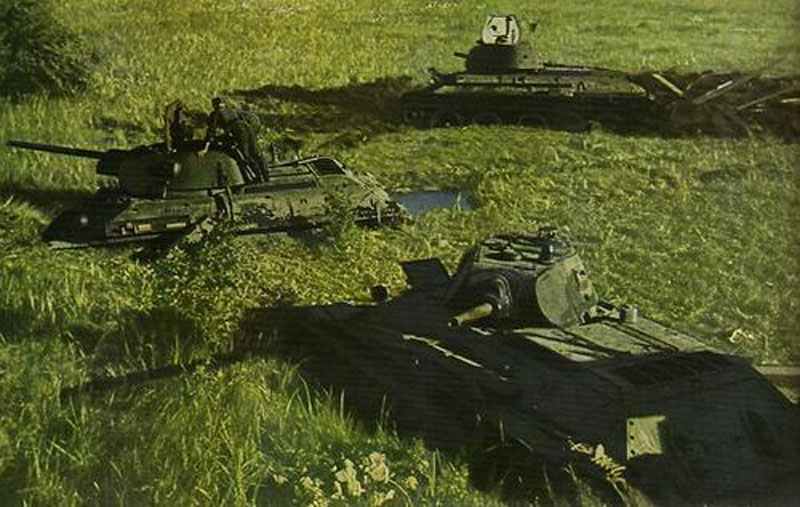 During the hectic fightings in the summer of 1941 these T-34 tanks moved into the Pripjet swamps and were captured by the Germans. The new generation of Russain tanks were the finest in the world, and were one of the few bright spots in the RKKA in 1941. The most immediate result of the experiences in Spain and the Far East was recognition of the need for thicker arm our to resist contemporary 37mm anti-tank guns, and the need for diesel tank engines for better fuel economy and reduced fire risk. Both the BT tank and T-26 had proven vulnerable, even to anti-tank rifles, thus exposing the fallacy that armour sufficient to resist heavy machine-gun fire was adequate. This led to intense interest in diesel engines because diesel fuel is less explosive than petrol. Experience in Finland 1939-40 also impressed upon Soviet designers the need to use lubricants capable of operation in very low temperatures. A design bureau under M. Koshkin was assigned the task of developing a replacement for the BT fast tank, and the new design was designated A-20. In May 1938, a wooden model was presented before the Defence Committee of the SNK. Koshkin argued that the vehicle should have an armour basis of at least 30mm to with-stand existing and future threats, and that a 76mm gun would be necessary to defeat enemy armour that was equally well protected. Stalin was personally taken by Koshkin’s presentation and this led to GVS permission for the KhPZ to build both an A-20 prototype and a heavier prototype, first called A-30 and later, T-32, which incorporated Koshkin’s suggestions. After test trials there was still no consensus in the GVS over the A-20 or T-32. Koshkin argued that the T-32 should be considered a universal tank capable of satisfying the needs formerly fulfilled by the BT fast tank, the T-26 infantry tank and the T-28 medium tank. Some members of the GVS were bothered by the fact that the T-32 would cost at least as much as 3 T-26 light tanks, and still supported-the A-20. In the meantime, reports from Finland had stressed the vulnerability of Soviet tanks to Finnish anti-tank guns and the inability of Soviet 45mm guns to damage bunkers. In view of the anxiety of the committee members, Koshkin interjected that his staff had prepared estimates which indicated that the T-32 could be up-armoured even further without an unacceptable degradation in mobility. As a result, the Defence Committee of the SNK approved an up-armoured version of the T-32 medium tank for immediate production to replace the BT fast tank and T-28 medium tank. The evolution of the T-34: from left to right the BT-7, the A-20, the T-34 Model 1940 and T-34 Model 1941. The new version was designated the T-34 medium tank, and representatives of the Commissariat for Medium Industry were given an objective of 200 T34s to be manufactured in 1940. The first two prototypes of the T34 were completed in February 1940 and put through gruelling trials. In June, Koshkin and the director of KhPZ, Maksarev, were summoned before an anxious meeting of the Central Committee of the Communist Party who were worried about the defeat of France. The Soviet leadership was gravely shocked by the rapidity of the French defeat, and in view of the RKKA’s miserable showing in Finland, feared that the Wehrmacht would soon eye Russia as its next meal. Stalin insisted that T34 production be increased from 200 to 600 tanks, with 500 coming from KhPZ and 100 from STZ. Mass production of the new design proved extremely difficult and the situation was not helped by continuing controversy over the selection of the T34 and bitterness on the part of many army leaders who were unenthusiastic about it. The first production T-34 Model 1940 did not roll out of KhPZ Nr. 183 until September 1940. Later that month, its designer, M. Koshkin, died, reputedly of pneumonia. In 1940, only 115 T-34s were produced, and some had to be manufactured with M-17T engines and BT tank clutches because of continuing shortages of the new V-2 engine and the new transmission. Details unknown 15-45 mm ? 1941 967 (June 22) 3,014 ? 1945 – 18,330 (6 months) ? Tagged 1940, medium tank, russia, t-34.